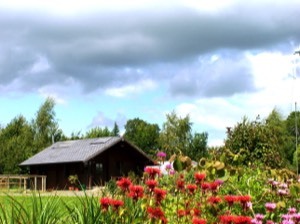 Welcome to The Little Wood House, an eco-lodge specially built as part of the CountrySOLE project. Come and enjoy glorious Herefordshire countryside and experience the pleasure and wonder of living entirely off-the-grid. The Little Wood House is set on a smallholding in deepest Herefordshire countryside, with stunning views, and next to a small Nature Reserve. Our self-catering accommodation sleeps 4-6, but can accommodate more on request. It features truly sustainable facilities that harness the earth’s resources responsibly. The Little Wood House is equipped with a wood burning Rayburn cooking stove, powered by solar and wind energy and has state of the art composting toilets. There are BBQ facilities for those warm summer days, and at the heart of everything is the circular garden, grown on permaculture principles, where you can harvest your own lunch! The farm footpaths lead through fields and woodland to local villages for delicious local provisions, a pub meal or a postage stamp. Camping is also possible and well behaved dogs are welcome. “..this is really one of the best stays in the countryside that I’ll remember all my life”.